The 740-kb linear plasmid p1CP of R. opacus 1CP harbors the genes of the 4-chloro-/3,5-dichlorocatechol degradation pathway (Fig. 6), another set of genes coding for the 3-chlorocatechol pathway (Fig. 6), and at least one maleylacetate reductase gene (Table 1). In contrast, the genes coding for the catechol and protocatechuate branch of the 3-oxoadipate pathway for the degradation of non-chlorinated aromatic compounds are not located on p1CP (König et al. 2004), which is in accordance with the chromosomal location of these genes in most other bacteria. 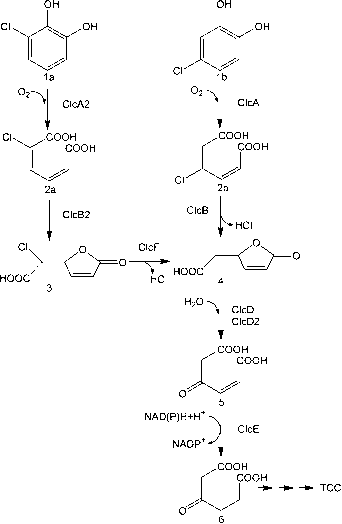 The clcA2D2B2F cluster of the 3-chlorocatechol branch is unique in that it comprises the clcF gene encoding a 5-chloromuconate dehalogenase, which catalyzes formation of the cis-dienelactone (Moiseeva et al. 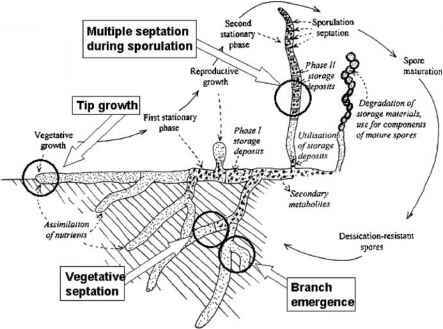 2002) (Fig. 6). Despite a significant sequence similarity of ClcF to muconolactone isomerases, activity toward muconolactone was not detected, suggesting evolutionary adaptation of the enzyme to the dechlorination reaction. The ClcA2, B2, and D2 proteins of the 3-chlorocatechol pathway share only 40-51% identity with the corresponding Clc proteins of the 4-chloro-/3,5-dichlorocatechol pathway, and thus were suggested to represent independent evolutionary branches (Moiseeva et al. 2002).